Allied School System Punjab Farm Campus Kasur Punjab. Interested Candidates submit their CV along with educational/experience certificates and CNIC, to the following mailing address Human Resource Department, Group Corporate Office, Allied Schools, 64 E-1, Gulberg III, Lahore. 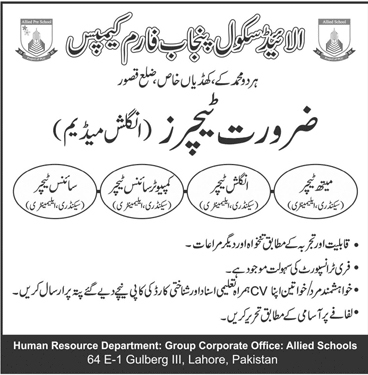 Group Corporate Office, Allied Schools, 64 E-1, Gulberg III, Lahore.